Dubversified Culture is about bringing the artistic community together through dub influenced music. Why the Bass Hive? In the beehive superorganism all members are aiming for the same goal; ensuring the survival of the colony. 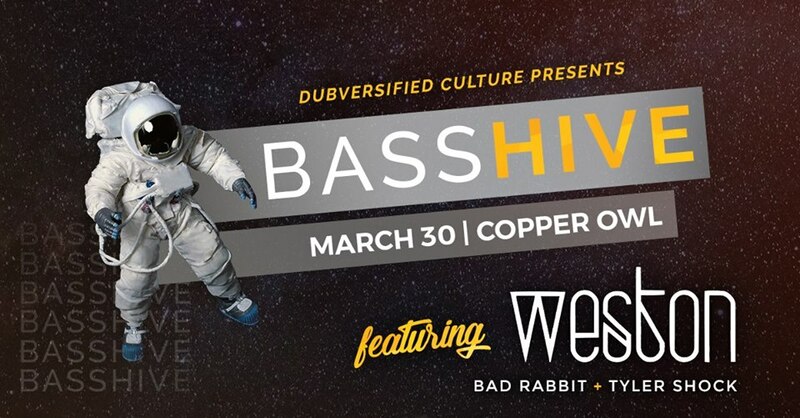 The Bass Hive is a series of events that wants to bring the Victoria Bass community together to ensure the survival of our festival minds over the winter. Bad Rabbit is Blackout x Nova Jade, a DJ Duo based in Victoria, BC that emerged after a meeting over tea, a few jam sessions, and a camping trip. They are spinning Bi-weekly on SUBFM and they are involved in many different projects in the Victorian electronic music scene. With 21 years of combined experience, and their shared passion for music, bass and dance, Blackout and Nova Jade as Bad Rabbit are a duo on the rise, with the energy to match. Got Rabbit Food? Starting out DJing in Manchester, UK resident DJ Tyler Shock brought home to Canada a dark and weighty style heavily influenced by the dark textures of underground UK dubstep, grime, and drum and bass labels such as Critical records and Deep Medi. Upon moving to Victoria out of Winnipeg, Tyler has continued developing a unique and varying style, taking in the sounds of West Coast glitch hop and bass house to develop an arsenal covering a wide range of styles and genres, able to step up and deliver selections for any mood or occasion.